Experts offer tips and advice on how to protect your business accounts even if your bank fails. After eight bank failures through Aug. 1 this year, business owners are wondering if they can bank on their money being safe. The Federal Deposit Insurance Corporation (FDIC) offers coverage up to $100,000 for deposits per bank, but many business owners have bigger accounts. "Security for the business owner is the No. 1 priority," says Peter Miralles, president of Atlanta Wealth Consultants. "They don't want to be doing payroll and find out the bank just shut their doors, and they're only insured for $100,000--that may lead them into bankruptcy. Businesses have to be very careful." According to the FDIC, when it seized IndyMac Bank in July, there was almost $1 billion in uninsured deposits. "I was shocked to hear how much people actually lost on that. A lot of people don't work with an advisor...business owners know their business but may not be experts on the banking system," Miralles says. Marilyn Landis, chair of the National Small Business Association (NSBA), says if your cash flow requires more than $100,000 in your account, you should look into the quality of the best bank to make sure it's not likely to fail. If it does fail, any funds beyond what's insured could be lost. But Landis doesn't recommend spreading chunks of $100,000 across several banks as a solution--that creates too much chaos and work in an entrepreneur's life. Check out FDIC, Federal Financial Institutions Examination Council (FFIEC) and your state's banking commission websites to determine your bank's rating, says Deborah Osgood, founder of BUZGate, a business networking site. Know what your bank specializes in, such as leasing or real estate. Know your bank's delinquency rates. Know your per-bank limits. The FDIC has very specific limits on how much of a deposit is insured. 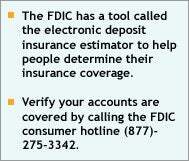 It's very important to obtain that information from the FDIC website to understand the amount that is or isn't covered. Ask your bank for its Federal CAMEL rating, administered by the National Credit Union Administration and based on five criteria: capital adequacy, asset quality, management, earnings and liquidity. The rating is from one to five, one being the best. Read your bank's annual report. "Huge losses and a high ratio of non-performing assets to capital are warning signs," says Rick Bastian, president of Blackhawk Bank. Ask your bank if it's a Certificate of Deposit Account Registry Service (CDARS) affiliate. "It's a new program that shares your deposits with other banks by negotiating a contract," says Frank Baldassarre, president and CEO of e3bank. It's free, lets you deal with just one bank and can insure millions of dollars. It works like a certificate of deposit, says Cheri Bliefernich, senior vice president of the banking division at Pulaski Bank in St. Louis. "Anything over $100,000 is invested in the CDARS and laddered out for one, three, six months--the higher the term is, the higher the rate is," Bliefernich says. If you're really concerned about your bank, start a dialogue with one or two other banks. "That way you're hedging your bets, before you have a huge need," Baldassarre says. Avoid thinking of your business finances as your personal finances. "When I see small business owners and entrepreneurs, they panic the way a person would panic about their own finances, because they don't have finance gurus telling them what to do," says Landis, chair of the NSBA. If you can, hire someone to manage your business finances, and have your bookkeeper help you keep in touch with your bank. "If your account is consistently in excess of $100,000, then the more important question is: Are you properly handling your cash management, and where's the best place to invest?" Landis says. A safe place to invest your excess cash is in Treasury bills, which can be held only in a brokerage account. The Treasury bill is backed by the U.S. government. If you decide on a 90-day Treasury bill, you know you're going to have that money available in 90 days. "Hold short-term Treasury bills in an account linked to the commercial banking account," Miralles says. FDIC insurance doesn't cover annuities, bonds, life insurance policies, mutual funds or stocks. For a small fee, Veribank will give a full bank rating and do your homework for you. Even if your bank's rating isn't good, keep in mind that it's very rare for a bank to shut down completely without another bank absorbing its deposits. "There have been banks that received cease-and-desist orders that don't really go out of business. It takes multiple series of catastrophic events for a bank to go out and not have another bank take over," says Natalee Greene, of NCG Consulting. When a bank is acquired, there may be some delay for a business to have access to cash. "For people in excess of the $100,000, they need to have a plan B if they didn't have access to that cash for a few hours," Landis says. Some banks awash in bad real estate loans are trying to diversify by expanding their commercial lending activities, according to Bastian. "The banks that are currently experiencing difficulty and showing losses are ones that became over-concentrated in a certain kind of risk, usually mortgage lending or land acquisition and development loans," Bastian says. Ask your bank if it has obtained deposit insurance bonds for deposits over the FDIC limit. "The strength of the bonding company or insurer is obviously critical here," Bastian says. This type of insurance is called a surety bond. If the bank fails to return the deposit at maturity, the customer then turns to the bonding company. One such company that provides surety bonds--up to 10 percent of a bank's deposits covering up to $20 million--is Kansas Bankers Surety, a subsidiary of Berkshire Hathaway. There's a "right of offset" for borrowers of failed banks that effectively insures deposits when the loan outstanding exceeds the deposit balance in a like-named entity. "If the XYZ company has a $3 million loan and a $300,000 deposit account when the bank fails, the XYZ company may elect the 'right of offset' and owe only $2.7 million to the failed bank," Bastian says. It's important to be proactive and communicate with your banker at least once quarterly. Tell them where your business stands, why and where it's headed. Have projections and assumptions. Ask for formalized written loan commitments to accommodate your future needs. A lot of business owners don't look into their banks' soundness, but it's a vital step to take to ensure money is safe, especially during an economic downturn. However, it's important to remember that this storm has been weathered before, and it's not as bad this time around. "The banking system today has more capital than at any other point in our history," Baldassarre says. "In 1990, during the savings and loan crisis, the capital-to-asset ratio was 6.45 to 1. Today there's a 60 percent increase from that 1990 ratio. We're better positioned to handle this shock than at any other time."